Leisure time has been at a premium for me ever since the birth of the twins. Feed Adam, feed Oliver, hold them if they’re fussy, sneak in a shower or wash the dishes if they’re not, hurriedly throw together a meal for myself, check Facebook and my e-mail. Repeat. Not long after the twins’ birth, I decided that for the time being I was going to have to choose between reading and writing; I didn’t have time to do both. Since I’ve made a determined resolution to finish my novel in progress (Road from the West) by this summer, I had to opt for the writing. Last week, however, I realized that the thing that takes up most of my time (feeding the twins) is actually quite conducive to multi-tasking. Child in my lap, bottle in one hand, book in the other. Turning pages is a little tricky, but isn’t that what your teeth are for? When in the mood for some light reading, Jasper Fforde is a favorite author of mine and also of my mother’s. 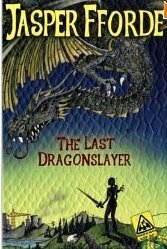 His latest novel, The Last Dragonslayer, has not yet been released in the United States, but a little thing like that doesn’t stop my mom–not when Amazon.uk so conveniently offers international shipping. After reading the book, she lent it to me, and I have a friend waiting in the wings, eager to borrow it in turn. Jennifer Strange is a foundling from the kingdom of Hereford who has been placed in indentured servitude at Kazam. An odd assortment of over fifty spellmanagers, wizards, and sorcerers, Kazam is a company whose magical powers are for hire to the average citizen in the unUnited Kingdoms. “The power of magic had been ebbing for centuries and with it, the relevance of Sorcerers. Once a Wizard would have the ear of a king; today they rewire houses and unblock drains.” There is nothing magical about Jennifer. She is the ordinary person who manages all the paperwork and schedules the appointments for the colorful characters at Kazam. Near to Kazam lies 320 square miles of pristine forest and meadows of Dragonland that no one is allowed to enter. Long ago, the great wizard Shandar set up marker stones to separate the humans from the evil flesh-eating dragons. Any human who crosses the marker stones would be instantly vaporized. Any dragon who leaves the Dragonland to prey upon humans and their property would be liable for punishment from one of the dragonslayers, an elite group of warriors established with Shandar. By the time of the twenty-first century, there is only one of these dragonslayers left, and coincidentally, only one dragon alive as well. When the Kazam pre-cogs receive a premonition of the impending death of the last dragon, the kingdom of Hereford goes wild. With the dragon dead, whoever stakes out a claim first will get a piece of the dragon’s land for his own. Crowds of ambulance-chasers camp out on the edge of the Dragonland waiting to get their share. Jennifer seems to be the only one worried about the prophesied dragon’s death. The wizards have always known that there is some sort of connection between dragons and magical powers, but no one knows exactly what that connection is. If the last dragon dies, will magic perish from the world as well? Jennifer sets out on a quest to locate the last dragonslayer and convince him not to kill the dragon. But on the way she finds that the mantle of dragonslayer has fallen upon herself bringing with it many difficult decisions. Should she let Fizzi-Pop or Yummy-Flakes become corporate sponsors for the Slayermobile? Should she allow the King of Hereford bully her into claiming all the dragonland for himself? Should she kill the dragon and possibly end all magic in the world forever? As usual, Fforde creates an imaginative world full of memorable characters, sarcastic humor, and contemporary and literary allusions. This book was a fun read, although the plot lacked some of the depth of his last book, Shades of Grey. I’m not sure of its official release date in the U.S., but if you can’t stand to wait, there’s always Amazon.uk.